This conversion plate allows you to change the holepattern of your LCD TV mount. It converts holepatterns from VESA 75x75 & 100x100 to VESA 100x200, 200x200 and 120x180 (special JVC holepattern). Ideal to mount larger TV's to wall and ceilingmounts. 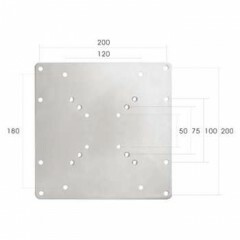 The conversion plate has a depth of 3 mm and is included with all needed mountinghardware.